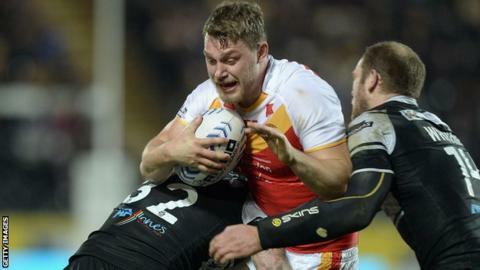 Elliott Whitehead scored a hat-trick to help Catalan Dragons to a comfortable win over Widnes Vikings. The hosts took a 14-0 lead with scores from Ben Pomeroy, Whitehead and Morgan Escare before Paddy Flynn and Jack Owens touched down to bring Widnes back into it but Whitehead went over again. Vincent Duport and Pomeroy extended the lead before Whitehead added his third. Lloyd White and Owens went over for the Vikings either side of Duport's second and a score from Daryl Millard. The Dragons have now won three of their last four matches in league and cup but remain 12th in the Super League table. They made a fantastic start with Pomeroy forcing his way over after five minutes and Whitehead collecting a Leon Pryce pass five minutes later to cross for his first. The hosts ran in their third try when Escare and Millard linked up to go the length of the field. Widnes fought back, first through Flynn before Owens got his hands on a Kevin Brown kick to get his first of the day, only for Whitehead to link up with Pryce again to give Catalans an 18-10 lead at the break. The French side picked up where they left off with Duport going in from a Whitehead pass and Escare feeding Pomeroy to get his second before former Bradford man Whitehead finished his hat-trick after a poor kick from Brown. White scored in the corner to reduce the arrears but Duport ran on to his own kick to score his second try and winger Millard ran in the home team's ninth try of the day. Widnes, who could have gone second with victory, had the final say with Owens going over from Hep Cahill's pass. "Elliott played tonight after two weeks out and to come back with a hat-trick is a great performance and great for him. "I think he is definitely putting his hand up to be selected in the England squad. He's playing pretty well for us at the moment, as is Zeb Taia and Louis Anderson, so we have good competition for places. "I'm pretty happy with the performance, especially given the heat out there. "The heat fell in our favour - but we knew it was going to be tough against Widnes. "Our style of play suited the conditions. We have started to get the confidence to play and offload like we did today." "We had some very disappointing performances out there - both individually and as a group. "Catalans had a lot of purpose about what they did and they did it very well. They got their arms free to offload, and (Morgan) Escare was very, very dangerous. "Two of their first four tries were from kick-returns and that is not us at all this year. "This year our kick chase has been really good, and our percentage of good ball on the back of our kick chase has been very high. Today we were trying to get going and looking for someone to spark us into life - but it just didn't come." Catalan Dragons: Escare, Oldfield, Pomeroy, Duport, Millard, Pryce, Bosc, Elima, Pelissier, Lima, Taia, Whitehead, Baitieri. Replacements: Paea, Guasch, Bousquet, Garcia. Widnes: Hanbury, Flynn, Hulme, Dean, Owens, Brown, Craven, O'Carroll, Clarke, Kavanagh, Leuluai, Tickle, Cahill, White. Replacements: Joseph, White, Clough, Johnson.